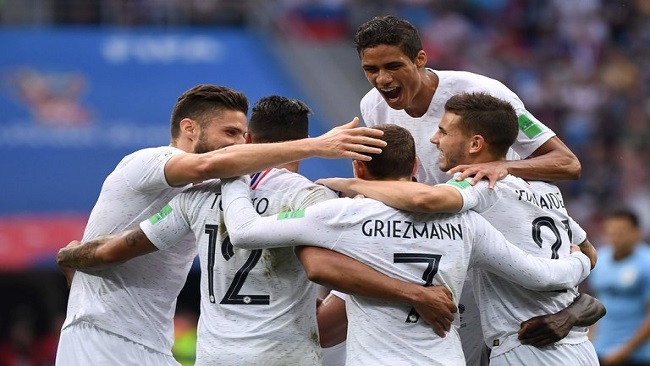 France advanced to the semifinals of the World Cup for the first time since winning it all on its home soil in 1998, clinically dispatching an undermanned Uruguay squad 2-0 at Nizhny Novgorod Stadium on Friday. France advances to play the winner of Brazil vs. Belgium, the other quarterfinal Friday. Raphael Varane and Antoine Griezmann both scored for France, with Griezmann’s goal coming on a goalkeeper howler by Uruguay’s goalkeeper Fernando Muslera. Edinson Cavani, a crucial counterpart to Uruguay’s star striker Luis Suarez, missed the game because of a calf injury. France displayed a multi-faceted attack, which allowed it to overcome a stout Uruguayan defense that had only surrendered one goal all tournament long. There weren’t the gaping holes that Kylian Mbappé so viciously exploited against Argentina, so instead they worked a variety of angles. They tried through balls to Mbappé, crosses to Olivier Giroud, free kicks towards their big center backs and whatever Griezmann wanted to do. Uruguay couldn’t neutralize France because there is no single player or single strategy to neutralize. The French defense on the other hand did have just a single player to stop and they did so successfully, taking Luis Suarez out of the match. Hugo Lloris only had to make one difficult save, a brilliant parry of a Martín Cáceres header, which came from a free kick. In open play, France shut everything down, and Uruguay didn’t manage a single shot on goal in the second half. France got on the board in the 40th minute, when Griezmann took a free kick after a foul by Rodrigo Bentancur, who had taken down Corentin Tolisso from behind. Griezmann lofted the ball in, and Varane rocketed in a header. Uruguay kept pace with France in the first half, not in passes, but in shots, and got a great opportunity minutes later. Lucas Torreira took a free kick and got it to Martin Caceres for a close-in header sent downward. But French keeper Hugo Lloris dove right and made a beautiful one-hander. The ball dribbled loose and Diego Godin arrives, but he failed to bundle it in. After that near miss, Uruguay struggled to create chances. France went ahead by 2-0 in the 61st minute. Breaking as part of a four-on-four, Griezmann tried a shot from distance. It should have been be a relatively routine save for Muslera, but it hit his hands, popped up, went over his head and into the goal. The game got ill-tempered soon after. After contact with Cristian Rodriguez of Uruguay, Kylian Mbappe went down, setting off both sides. Godin, suspecting play acting, urged Mbappe to get up. Players tangled, and there was shouting, pushing and shoving. For a moment, it calmed down, then started up again. In the end there was a yellow card for both Rodriguez and Mbappe. France then set about killing off the game, controlling possession and not letting Uruguay get much more than a sniff of the ball. France won’t face such an impotent offense in the semifinals, where either Neymar and Philippe Coutinho of Brazil or Eden Hazard and Kevin De Bruyne of Belgium await. But Les Blues have no obvious holes to exploit, and there is no easy way to stifle their attack. It wouldn’t be surprising to see them lift the World Cup trophy in Moscow next Sunday.